Based on name, description, and tags. 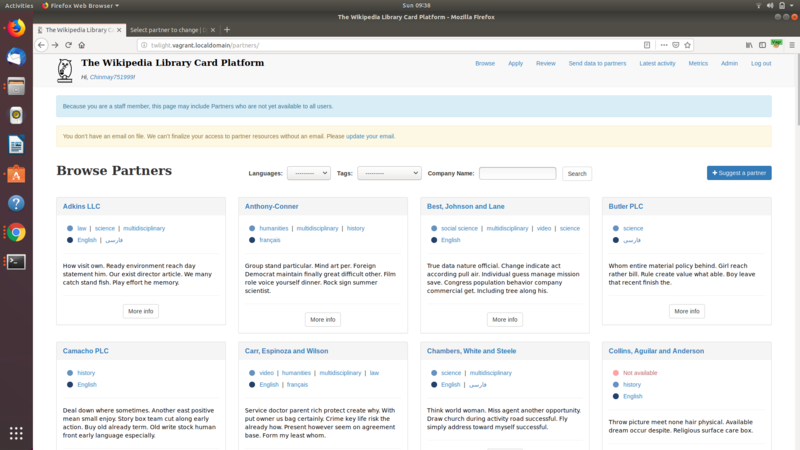 Samwalton9 moved this task from Incoming tasks to Doing on the Library-Card-Platform board. Samwalton9 added a parent task: T170977: Post-migration issues and priorities. Filtering now live. Search bar possibly a future addition. Samwalton9 removed a parent task: T170977: Post-migration issues and priorities. Samwalton9 added a subscriber: Camp5456. Samwalton9 removed a subscriber: • 238482n375. @Aklapper Could you remove the Security flag please? Not sure what's going on above. We had talked about having the search bar search both the partner names and their descriptions, so a user could search 'newspaper' and retrieve both NewspaperArchive.com and Newspapers.com, but also any partner with 'newspaper' in the description. Would that be possible? The search box could then just be labelled 'Search' rather than 'Company name'. It'll only search partner names, because searching in description may give unrelated partner names. So if a person want to search any company related to "newspaper" so he may select a filter based on tags for it. Ok, I think that's fine. I would like it to search both partner and description because a user may search for something that isn't a tag, like "women" to return both partners with "women" in the name (Women Writers Online), but also partners with collections containing the word, e.g. Alexander Street Press (Women and Social Movements Library) and Past Masters (Women Writers Collection). Because we're moving towards a Meta-based content translation model T171874, with no description whatsoever living on the platform, it's probably better to put a hold on this one for now.